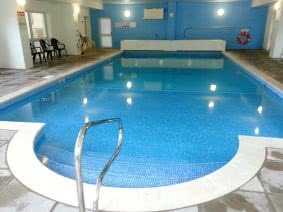 Large party house with huge indoor pool, in lovely grounds on North Devon's coast. Sleeps 26. Devon holiday home with indoor pool. Sleeps 26. Only one weekend left before the summer! 28th June reduced by 25%. Just £3150 for 3 nights! 23rd August weekend reduced by 25%. Just £3900 for 3 nights! Major Improvements are now complete! Click for details! Explore the whole house in our fabulous 360 degree virtual tour, below. Large cottage sleeping 26 with huge indoor pool and hot tub. 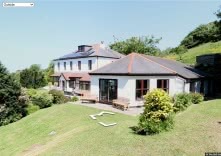 A luxury North Devon self catering holiday home for families, parties or any special occasion. Bicclescombe Grange lies on the outskirts of the lovely seaside town of Ilfracombe and is set at the end of a private drive, within four acres of superb gardens, adjoining open fields and countryside. Bicclescombe Park, with tennis courts, play area, working water mill and tea room sits at the end of the drive whilst nearby are the wonderful sandy beaches of Woolacombe, Saunton and Croyde. See the Location page for more information on the surrounding area. Since opening in 2014 Bicclescombe Grange has hosted many special occasions. It's perfect for a 40th birthday party, a golden wedding, or any other special family gathering. Or, if you need a great venue for your stag do, or hen do, then look no further! We've held a VisitEngland 4 Star Gold Award for the last three years, so you can be sure of quality throughout the house. There are eight large bedrooms arranged over three floors, along with a large kitchen, lounge and dining room seating 26. See the House page for full details and floorplans. 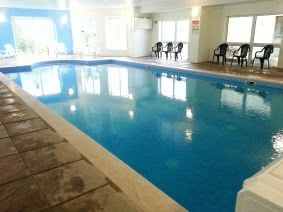 There's plenty to do, all under one roof: Swimming in the 40' heated indoor pool, relaxing in the hot tub, table tennis, darts, or snooker on the full sized table. We've got a large 60" television with all Sky's channels, free Wi-Fi throughout the house and for the younger children, there are lots and lots of toys! See the Facilities page for more details. The Grange has a large kitchen too, with granite surfaces, marble tiles, solid oak furniture and stainless steel appliances, including a 7 burner range, an enormous American style fridge freezer, an ice maker and a large capacity wine cooler. See the pictures on the Photos page. Outside the private grounds extend over many levels, with much of interest to find: ponds, waterfalls, large grassy areas for play, footpaths through the woods, and of course, the alpacas! 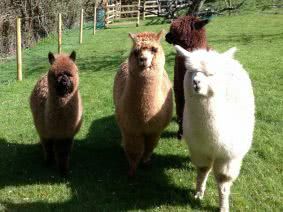 Ben, Sammy, John, Hector and David are always happy to meet the guests, especially at feeding time! And beyond the grounds there is lots and lots to do. Ilfracombe is home to many fine restaurants and pubs and the ice cream and fish and chips are always fantastic! Surfing and water sports generally are very popular in the area and quad biking and horse riding are also nearby. There are also many local places of interest to visit, such as the funicular cliff railway at Lynton and Lynmouth. See the Things to do page for many other suggestions. Feel free to explore the site and keep an eye on our News page to see what's been going on lately. Or, if you have any questions please do contact us. 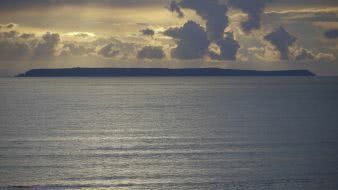 How about a trip to the fantastic local Lundy Island?